Michael and Isaac are off for a weekend vacation trip to Pluckley, a village in the southeastern part of England, where Isaac was born. Isaac knows that the fastest way to travel requires them to cross certain woods with a bad reputation: Dering Forest. Neither of them are really scared about the hearsay that this apparently beautiful piece of vegetation is actually cursed, as it's nickname among the habitants of the county is actually "The Screaming Forest". 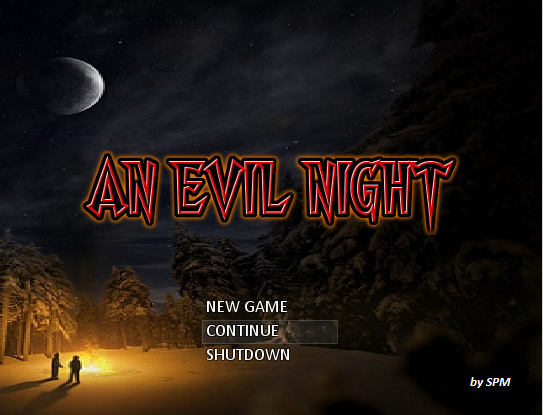 An Evil Night is a short old school dark horror game meant to last about an hour. There are two files, one with the RTP included and the other not. The RTP is needed to play, so choose which suits you better. Pretty fun stuff, liked the Lovecraftian vibes! Hello to all!!! I finally got some time to top off the final version of the game, 1.1 which is now [b]live[/b] and ready to download!!! - Fixed a couple of bugs on transparent walls in the Tomb zone. - Fixed some mispelled dialogs (sorry) and added new ones (specially at the end). As I said before this will most likely be the final release, so I hope you enjoy! !